The word, ‘acceptance’, is often used in Buddhist circles, and yet, it often leads to misunderstanding. This is not usually how ‘accept’ and ‘acceptance’ are used in relation to Buddhism and mindful meditation – in this context, acceptance does not necessarily signify that we agree with, condone, or are resigned to, a particular course of action or opinion. Acceptance in this sense does not imply resignation. In relation to being mindful, acceptance means acknowledging, engaging with, and fully recognising, that things are the way they are. Acceptance is being aware of what is happening without the reactive habits that usually accompany our awareness – for instance, judgement, commentary, rejection, controlling, clinging and so on. Acceptance is another way of saying: ‘I am aware and awake to this state of affairs without attachment or comment’; or, ‘I can see that this is how things are. I am present and mindful’. Until we fully accept that things are the way they are, we cannot act or respond in a clear, creative and considered way. 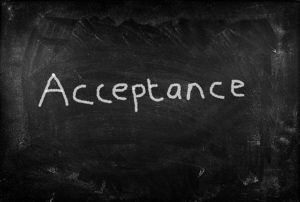 Without acceptance, we cannot act decisively, in a balanced and informed manner, to events, thoughts, emotions and conflicts. Until we know what is going on, or how things are, we cannot make a fair judgement, let alone act in a useful or helpful way. Attention and acceptance are necessary preludes to wise or skilful actions. Resignation is a very different notion – it is a passive response to an event or situation – it is an acceptance that nothing can be done. It involves disengaging, turning away, being unmindful – no longer willing, or able, to act decisively because we have given up on being present and are no longer paying attention. To accept that this is how things are, is not to say that this is how things should be or will be in the future. But until we are mindful and accept that this is how things are NOW, at this moment, we cannot say how things should be, or will be, in the future. Clear-sighted acceptance is to be mindful of how things are, and is the necessary prelude to skilful, helpful thought, communication or action. Acceptance, in this sense, is an integral part of the practice of awakening.